I call you to be like children so that you would be worthy of the protection of the Heavenly Father, being authentic and true, since you need spiritual goods at this instant and need to know how to put them into practice. On Monday, August 28 of the year of the Lord 2006, a new invocation of the Blessed Virgin Mary was revealed to Luz de María by our Lord Jesus Christ under the title of “QUEEN AND MOTHER OF THE END TIMES”. A GREAT PART OF THE INVOCATIONS TO THE BLESSED VIRGIN MARY ARE GATHERED IN ONE SINGLE IMAGE THAT REPRESENTS HER. Later the Heavenly Mother dictated a prayer for all of God’s People, with which She invites us to invoke Her especially in these instants of great tribulation and confusion inside and outside the Church. Grateful to Heaven for such a great heavenly gift, we exhort the People of God to receive with faith and gratitude over this divine help that springs from the loving Will of God that wants to protect all of us in the present and the future through the maternal help of the “Queen and Mother of the End Times”. I grant the “imprimatur” to this new invocation, to the prayer with which we can implore Her with confidence and to the representation or image that artistically expresses the vision had by Luz de María, at the same time I extend the invitation to participate in the novena to prepare for the feast of our ¨QUEEN AND MOTHER OF THE END TIMES¨ whose feast day will be on August 28. “Upon My image rests the Holy Spirit, of whom I am Temple and Tabernacle. My Crown has three Crosses: the middle Cross belongs to My Son’s Cross, the one on the right to remind you of Divine Mercy and how the repentant thief attained forgiveness and won Heaven, and the one on the left for you to keep in mind the one who mocked My Son, being on a cross, and condemned himself. The Scapular on My Chest is a sign of the commitment that My children have so that their life be alike to Mine: in obedience and faith to the Word of God. My Sacred Heart illuminates the life of men and, in the end, My Immaculate Heart will triumph. In My Womb, My Son is seen in the Holy Eucharist, unfolding His Love through yellow rays. On the wrists of My Hands you will notice a star, so that you remember that I am the Morning Star of the New Dawn and guide the People of My Son. My Hands shine with light so that My children do not go astray and see the light of the beacon of My Hands, from which rays emanate that converge with the rays of My Son, present in the Holy Eucharist and deposit themselves in blessing on the newborn child, who represents, in the first place, Our beloved Angel of Peace—fruit of the Trinitarian Will—who is presented to Humanity by the Hand of God the Father who is guarding him. Second, the child represents the Holy Remnant. That Holy Remnant that is being protected and maintained on the Earth of peace, by the Hand of God the Almighty Father. The Earth, at this instant, is surrounded by My Holy Rosary, just as the renewed Earth will continue to be surrounded by My Holy Rosary. And with each Our Father and every Hail Mary that you have prayed in the Rosaries and in other prayers, you have multiplied them to infinity, because prayers will always bear fruits of life and in abundance. The Earth is shining, and the darkness will have passed. My Invocation represents the Hope of a new Heaven and a new earth. As a preparation to the Festivity of August 28th. Note: This Novena can be done with love and devotion at any time of the year. Divine Father, Eternal and Omnipotent, Holy Son, Word Incarnate, Holy Paraclete, Divine Spirit, Three Persons in one True God. Pour out Your Most Holy Blessing upon this creature who cries out before Your Divine Majesty. Take my hand so that I am not separated from Your Protection, give me the immovable hope of the encounter with Your Glory. May my soul be sculpted by Your Holy Spirit and I find the discernment that leads me to the Truth of Your Word and I do not deviate from the Holy Path. Most Holy Trinity, you have bequeathed to Your People the blessing of possessing the Queen and Mother of the End Times, to intercede for and defend Your People. and I surrender to Her Maternal Instruction so that, together with Her, I may be a doer of Your Will. Mother who guides, Mother who intercedes, Mother who protects this aimless Humanity, be my helm at this instant, so that, before the clutches of evil, my soul does not succumb out of weakness. Give me the willpower so that I may not fear the waiting, but rather that I may fear falling into the insinuations of evil and do not let my soul be lost in the darkness of evil. Queen and Mother of the End Times, come, receive me and teach me to wait for the Trinitarian instant, may it not be I who wishes to advance the hour, but under the protection of Your faithfulness, may I be Your reflection and may no instant frighten me before which it looks like I may succumb. and also, the courage to live like You, nourishing myself with the Trinitarian Will and continuing with the fervent faith that You will lead me towards the longed-for encounter with the Father, the Son and the Holy Spirit, being reborn to the new life beside the Most Sacrosanct Trinity. Pray for the conversion of Humanity. Queen and Mother look at me, I live alone, come to me, I need Your Love. Place my petitions in Your Heart, which I beg you to accept: (add personal petitions here). Illuminate me with the rays of Your Obedience, Faith, Hope and Charity. I wish to help my brothers and sisters with Your same Obedience, so that together, we may know Your beloved Son. Amen. Offering: I invite you to offer My Son obedience. Pray for those who do not know the Most Holy Trinity. May Your Heart be the treasure where I discover the infinite dimension of Trinitarian Love. Do not let me be an ungrateful child who denies the Creator, do not let me be a blind creature who denies Redemption, do not let me be so deluded as to think that without the Holy Spirit, my conscience can be enlightened to discern between what is of God and what is not of God. Queen and Mother, I beg You that I may be an instrument for the good of my brothers and sisters. Amen. Offering: On this day I ask you to carry out works of mercy towards the needy. Pray that the persecutors and enemies of My Son’s People will be dispersed. Queen and Mother of the weighed down, look for me, I call You with all my strength. Do not allow my reason be greater than my heart, ignite in me the courage to take the path of conversion. Even if I be persecuted on Earth for loving Your Son, bring Your Angels and come with me, come and teach me to resist by looking, at every moment, Your Motherly Face, may Your gaze penetrate my thoughts, and may I not drift away no matter how much the world offers me the fruits that would lead me to sin. Receive, Queen and Mother, my wishes and in You, make them come true. Amen. Offering: I call you to adore My Son. Offer this day for your personal conversion. May the joy of looking at You lead me to continue delivering the best of me each and every day. Queen and Mother fill my heart with Your Strength and my mind with Your Obedience and Firmness. I want to go forward towards Eternal Life, I yearn for my human ego to be an instrument for spiritual growth. Queen and Mother fill me with Your Gifts, help me to overcome the need of wanting to always be the best and the most applauded. Come, Queen of Heaven and Mother of Your Son’s People, make me a new person, innocent, that surrenders at Your feet to grow under the protection of Your Purity. Amen. Offering: Share food with the needy. This day I call you to love your brothers and sisters and not to reject them. My Jesus, teach me to look at Your Face in my fellow men, I need my eyes not to be so human, I need them to be more spiritual so, they will see with Your same Love. Queen and Mother share with me the light from Your Gaze which You possess from the Holy Spirit. Come, I beg of You, so that my mind, my thoughts and my heart be more in the Divine way so that pride, prejudices, and feeling saved and more than my brothers and sisters be detached from me. My Jesus, I want to be fully aware of what it is to be Your son and a member of Your People. Aware so that I not feel saved by saying that I love you, instead, that I realize that he who loves You loves his neighbor without distinctions. Amen. Offering: I ask you offer Holy Communion for your brothers and sisters, those you do not love as you should. On this day, you will bless all the brothers and sisters that you see; you will bless them all with your mind, with your thoughts and with your heart: all of them. Queen and Mother of the End Times, come and take my mind, my thoughts and my heart, so that it be You who blesses my brothers and sisters in me. As I am incapable of blessing without distinctions and not having fulfilled the First Commandment, I pray for Your Motherly help, that I be obedient to the Commandment of Love. Queen and Mother, come and renew my heart so I may love my brothers and sisters as Your Son loves: without distinctions. Give me a renewed mind and thoughts not to create obstacles in my heart that interfere, thereby denying myself Eternal Salvation. Amen. Offering: On this day you will resolve to be love to your fellow men so that jealousy, envy, vanity, desire for possession, lack of love, and materialism disappear. Offer this day so that fidelity grows, and you do not wane during the serious instants. Loving Father, Merciful Son, Holy Spirit, the comforter, be adored everywhere. Omnipotent and Everlasting God, send Your Holy Spirit upon me, I prostrate myself before Your Majesty, I humbly implore for the Gift of Fortitude that I do not decline no matter how strong the trials may be. Most Holy Trinity, I abandon myself in You so that I awaken in this instant and my vision not be clouded by modernisms. Give me strength to remain faithful to Your Word and to be compliant of Your Commandments, convinced that this is the good for my salvation and that of my fellow men. Give me Holy Wisdom to understand that in order to love you, I must deepen my knowledge and understanding of Your Word. that illuminates my path. Amen. Offering: Children, on this day you will meditate on how far away man is from God. Make reparation for the distance of man towards his Creator and the unbelief towards His Word. Queen of my life, come, take my physical senses and lead them to recognize the evil that exits in all that surrounds us, so that my senses will not lead me to what is improper. I offer you my human will, keep it in Your Hands and hold it, so that I will not be indifferent to the Divine Love nor to my neighbor. I surrender to Your Maternal Guidance, as Your child who does not want to take the wrong path and lose Salvation. Amen. Offering: On this day, you will do an act of mercy. I call you to consecrate yourselves. 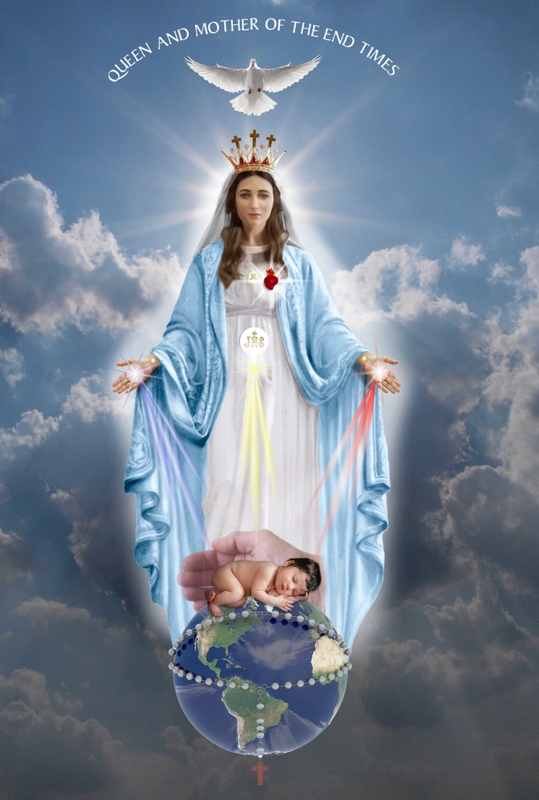 Queen and Mother of the End Times, I am your child, receive me, I give to You my life and in Your Hands, I place my will, all I have and all I am, my aspirations, desires and projects. Take away from me all attachment to material things, so that I will look for possessions which cannot be seen because they are spiritual. I consecrate my life to You today, Queen and Mother, I freely surrender to Your Protection in such difficult instants in which I live, be the Ark that will lead me to remain afloat without sinking in the middle of the purification. May the Rays from Your Hands enlighten my mind, my thoughts and my memories that they be healed, my sufferings, so that I offer it and my falls, so that You will lift me. Illuminate my reason so that it does not compete with my faith, but one be the light of the other. I consecrate myself to You and surrender to You within the freedom of the God´s children. Amen. •	† The virtue of Hope, so that you do not desist in the instants when you feel the path seems long, and so that the happiness of being a child of God will not move away. •	† I will not allow despair to take hold of you, neither will allow you to believe that My Son has abandoned you. Whoever asks for mercy of heart and firm purpose of amendment will receive them. •	† I will provide you with the Gift of Wisdom, so you will be children attached to the Divine Word and not be confused, as children who look the Mission that God has entrusted to them. In this way you will not harm the Divine Plans. •	† You will receive the Gift of Strength so that your faith will be firm and strong, persevering, and at the same time, love guides all. •	† Families will be more united and fraternity among brothers and sisters will be stopper to evil. •	† I will provide love between spouses so that it increases. MY BLESSING WILL BE WITH YOU AS LONG AS YOU ACT WITHIN WHAT IS GOOD.